At the Job step of the wizard, specify basic settings for the backup copy job. In the Description field, enter a description for the job. The default description contains information about the user who created the job, date and time when the job was created. The backup copy job runs continuously. The synchronization process starts at specific time intervals. During this backup copy interval, Veeam Backup & Replication copies new restore points from the source backup repository to the target backup repository. In the Copy every field, specify the time interval according to which the synchronization process must start. By default, the backup copy interval is set to 1 day. 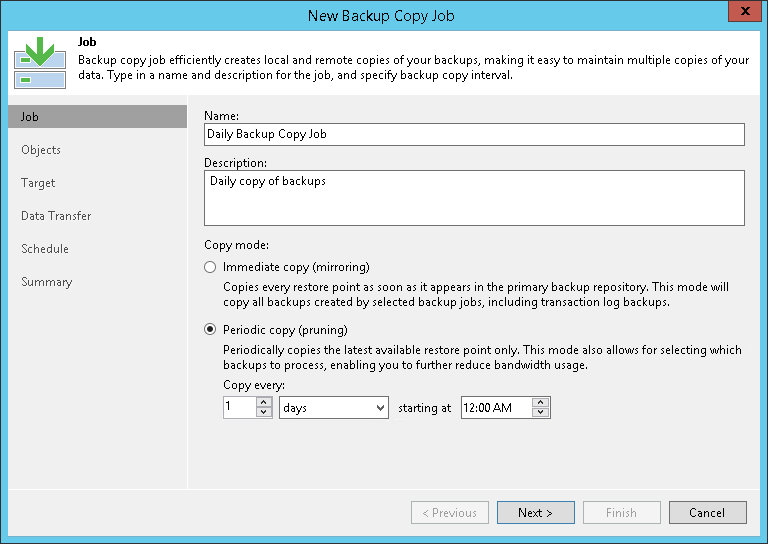 This means that the backup copy job will create a new backup copy interval once a day. Veeam Backup & Replication will check if new restore points are available on the source backup repository. If a new restore point is found, it will be copied to the target backup repository within the backup copy interval. For more information, see Backup Copy Interval. If you have selected a daily backup copy interval, specify the start time for it. By default, the daily backup copy interval starts at 12:00 AM. In some situations, the backup copy synchronization process may not manage to complete from the time the copy interval begins to the time the copy interval finishes due to a new copy interval beginning. This can happen if the defined backup copy interval is not enough to copy a restore point. If such situation occurs, Veeam Backup & Replication will display a warning in the job session results. It is recommended that you increase the backup copy interval time.